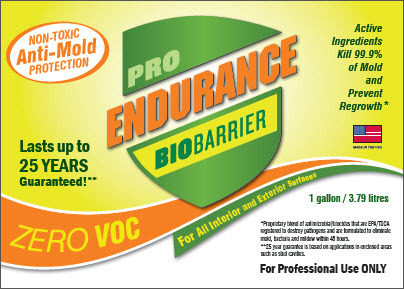 Services: Endurance Bio Barrier Cleaner Prep removes mold and Endurance Bio Barrier is guaranteed to prevent mold from growing for up to 25 years. I am concerned with the long term effects of mold on my health so I researched many products and determined that biobarrier is the best and it is nontoxic. I spoke with customer service and am very pleased with the company. The product is great and placed a second order since I ran out of previous order from 2015. Thanks. Just what we needed for our mold maintenance after the 1,000 year flood in Louisiana! Contacted the manufacturer and they were very helpful with product information. This stuff is FANTASTIC if you have a mold problem. I cleaned our white shed at the beginning of April and the mold has not come back. A month ago I had an unexpected water leak and my basement became very humid. I promptly began the process of drying the area out and was so happy to receive my order of Endurance BioBarrier Mold Prevention Formula in very prompt fashion. I followed the straight-forward and simple instructions there has been no sign of mold or mildew since. Excellent service and excellent product. I live in Hawaii on the "wet" side of the island and am always dealing with mold. Believe me when I say I have tried my share of anti-mold sprays. Endurance BioBarrier is the first one I've found that actually works. Mold that was coming back with other sprays is now not coming back at all. Amazing! It works! A lifesaver in a humid climate. Came strongly recommended by a friend. Using on a thick canvas that tops the smaller of my chicken runs. Enormous amount of rain over a 2-week period led to mold and mildew inside and out. Cleaned thoroughly and sprayed with 2 bottles. Returned chickens hour later and they seem no worse for the wear. Have high hopes this will last at least a year! I was skeptical that this would really prevent mold but I gave it a try. My tub, tiles, grout and caulk would usually get mold within a week after cleaning. Since using this product one time a few weeks ago, there is still no mold or mildew anywhere. This cuts down on a lot of major cleaning. The Cleaner Prep worked well on about 30 wooden steps down to our dock and lake. The real key to success was to apply the liquid and let it dry, then apply water and scrub all surfaces with stiff brushes. This took 2-3 hours with 3 people working. We then flushed with water, but the overnight rain helped the most. All the bright green algae and mold was completely gone. Dear Greg, I spoke with you approx 6 month ago regarding flooding in my basement with is carpeted. I spent some time checking into several products that could be used on carpet; that would be non toxic to animals and children; and that would not leave a horrible odor. It did take some doing as your products were categorized as mold prevention, not mold clean up or remediation. I hope that has been corrected. In any event, I want you to know that I used the EBB Cleaner prep to clean the carpet and applied the EBB Mold Prevention once the carpet dried. The product worked BEAUTIFULLY!! There was no lingering odor; the carpet was restored to its prior condition without any discoloration, and dried within hours. There have been no adverse affects to pets, children, adults, plants; and there has been no mold growth in the months since application. I worked over 30 years in apartment management, real estate appraisal and brokerage, and highly recommend this product on a consumer and professional level. I also continue to use the Cleaner Prep for general purpose cleaning. Great products! Dear Greg, A friend offered to show me your new mold removal product which he was excited about. I said, "Let's try it on that mold in the tub that has been there for years." I was amazed! The EBB Cleaner Prep ate through and removed the 1/16 inch thick black mold.The Endurance BioBarrier mold prevention has also worked great. I was really surprised and shocked 3 months later when the place where the mold had been, actually appeared to continue getting even cleaner and whiter! Thank you for the opportunity to use your great products and for getting rid of that nasty mold.Sincerely,David C.
I wanted to thank you for introducing me to the Endurance Bio-Barrier. We have tried the product in many different restoration situations and found it to be extremely beneficial as a malodor preventative and as an anti-microbial during the structural drying process. I have found it to be far superior then some of the well known brands out there. We utilized this product in two main situations. We had an old fish market which had a malodor issue. All the standard commercial antimicrobial products had been used with no long term success. The current products would work but the smell had a tendency to reappear after a week or so. My customer needed a more cost productive approach. Endurance was applied and has successfully eliminated the malodor in the space. We had a vacancy which suffered water damage. There was no electricity and no way to provide appropriate structural drying techniques other than extraction. We applied one application of Endurance and found it to prevent the malodor that usually accompanies this situation. We will continue to use this product to counteract malodors during our structural drying process. This product will be used also as a mold preventative during these processes. Thank you again... Sincerely, Andrew Reaid, Operations Manager New Age Restoration & Coatings Inc.
We are proud distributors of Endurance Bio Barrier, the world’s first, long lasting, non toxic mold prevention solution.